Is there a better way to ring in the new year than eating? The answer is "no." 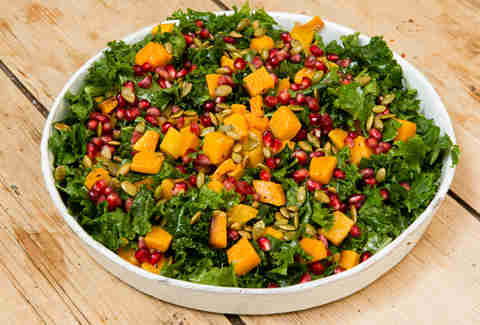 And while you could stuff your face with chips and dip, why not eat foods that will supposedly bestow your life with prosperity in the new year? There are New Year's resolutions to be made and goals to achieve -- we need all the luck we can get. Luckily (pun intended), there is a sundry of foods that, when eaten on New Year’s Eve or New Year's Day, are said to call forth good fortune in the coming 12 months. Here are 11 foods to eat for good luck in the new year. Seeds are associated with fertility and life, so eating pomegranates may just be the key to a lively new year. 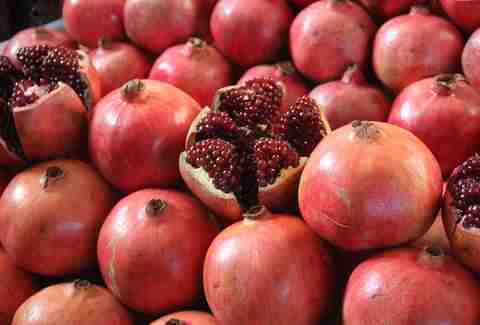 In Greek culture, a pomegranate is placed outside the home and smashed on New Year’s Day. The more seeds that scatter during the initial smash, the luckier the year that lies ahead will be. In Turkish culture, pomegranate seeds are also celebrated for fertility, so if you’re attempting to start or grow a family, you might want to stock up. 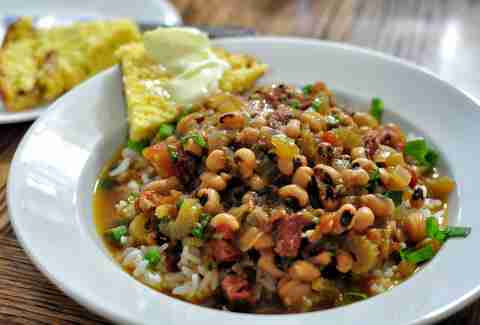 Black-eyed peas, simmered into a stew with ham hock and collard greens, is known as Hoppin’ John or Carolina Peas and Rice, and it is a traditional meal in the south eaten on New Year’s Day. There are a couple of myths surrounding the luck associated with black eyed peas. Some say the shape of black-eyed peas -- which are actually beans -- represent coins and therefore encourage wealth. Others trace the humble black eyed pea back to Civil War era, where the beans are said to have prevented families from starvation. Whatever the reason, black-eyed peas continue to remain a traditional lucky food to have on January 1 throughout much of the South. Any excuse to eat cornbread is OK in our book. 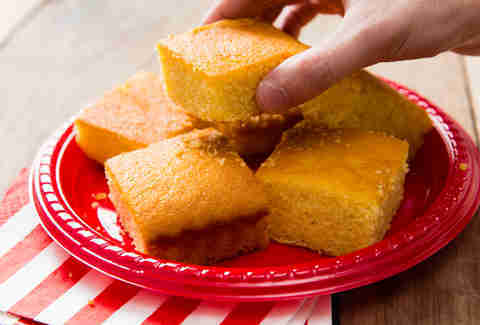 In many of the southern states in the US, cornbread is considered lucky due to its golden brown color -- which is said to bring gold and wealth in the upcoming year. So slather on some butter, dig in, and maybe pair it with a bowl of Hoppin' John for extra luck. 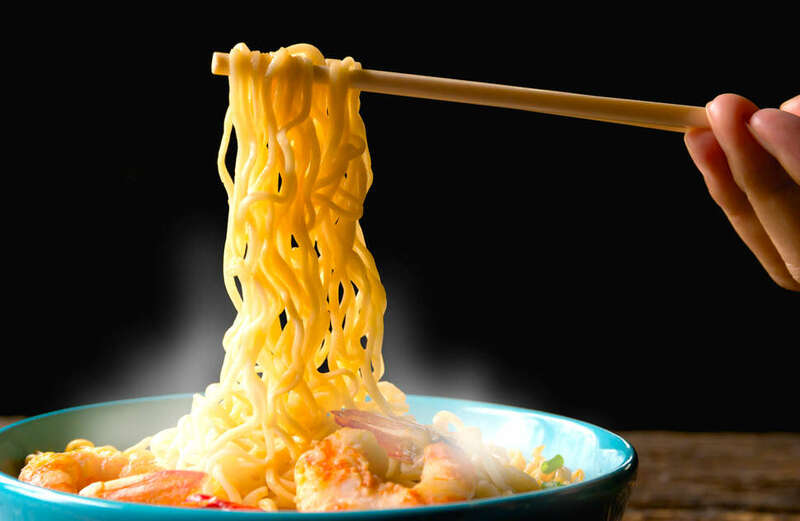 Different types of noodles are consumed across Asia in the new year and symbolize longevity. 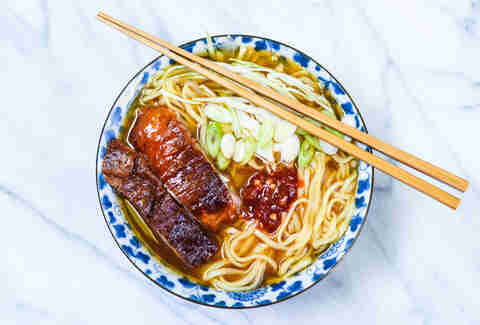 In Japan, Toshikoshi Soba -- a meal composed of buckwheat noodles in a steaming broth of daishi, soy sauce, and mirin -- is a common meal to consume on New Year’s Eve; a healthy and simple way to start the new year off fresh. In Chinese culture, yi mein noodles, the satisfyingly chewy and brightly yellow egg noodles, are stir-fried and said to encourage long life. Whatever type of noodles you fancy, slurp them up and you may not be only full but also blessed with a long and fulfilling life. In Spain and Mexico, it is tradition to eat 12 grapes at the stroke of midnight, representing the 12 months within a calendar year. 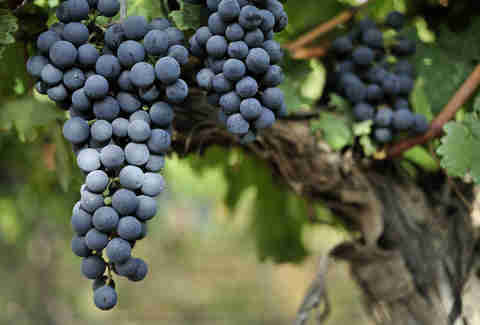 It is believed that the luck you’ll possess each month is dependent on the sweetness of the grapes; if you come across any tart grapes, then make sure to prepare yourself for a bumpy month that corresponds with the sour grape you consumed. We will joyously consume cake for any occasion, so this whole luck thing just feels like a bonus. Round cakes are typically considered lucky due to their shape -- they somewhat resemble coins and are thus thought to bring forth wealth in the new year. In Greek culture, friends and family gather around for a vasilopita -- a zesty orange cake that often has a coin baked inside. 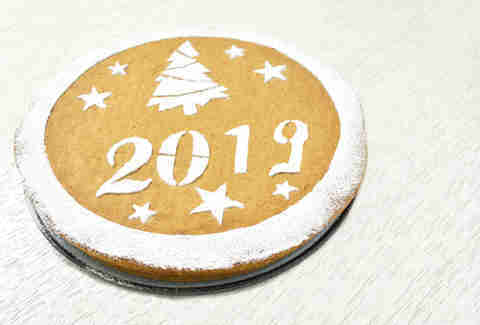 Whoever receives the slice with the coin in it gets extra luck for the new year and usually a gift or prize. So bust out your cake pan and bake yourself some luck for 2019. If you’re looking to personally advance in the new year -- as all of us are -- pork may be a good option for you. Pigs are animals that root forward as they sniff out and eat food, and therefore emblematic of progress in the year. 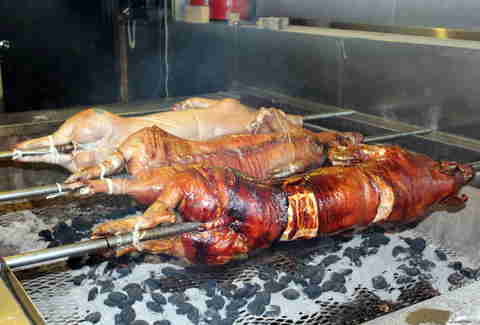 The tradition spans across continents; from roasted lechon in the Philippines to (technically not pork but I digress) marzipan pigs in Northern Europe to pork and sauerkraut dishes served in the States. As noted in The Morning Call, eating pork is “part superstition and part tradition… like a Pennsylvania Dutch-style insurance policy for the new year.” The fattiness of pork is also related to luxury and wealth, so don’t hesitate to fry up some bacon to start off the new year. 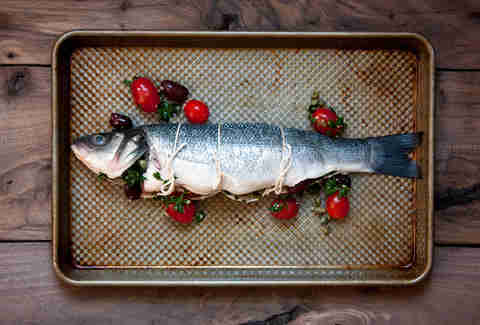 If you’re looking for an alternative protein to eat when ringing in the new year, why not try fish? It’s alleged that the scales look like coins, and in some Eastern European cultures they are saved and placed in a wallet in hopes of acquiring more wealth. Fish also represent abundance due to the fact that they swim in large schools. Across myriad cultures -- from steamed whole fish in China to Polish pickled herring -- fish are consumed in hopes of a year full of success. Whatever the preparation, it wouldn’t hurt to eat an extra serving or two. 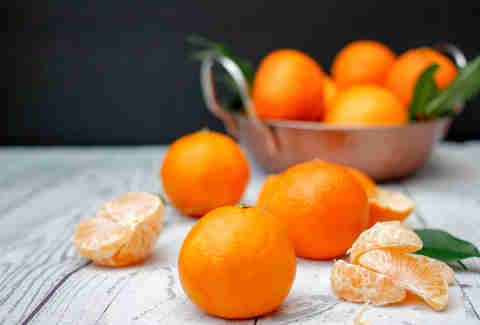 Oranges and tangerines are typically passed out during Lunar New Year—the East Asian celebration that follows the Chinese lunar calendar—to call forth prosperity, so it’s only natural that these citrus fruits have made their way to our Gregorian calendar celebrations as well. The bright color evokes joy and the Chinese word for a mandarin orange, kam, is a homonym for the word "gold," thus making the mandarin orange an extra lucky piece of fruit. 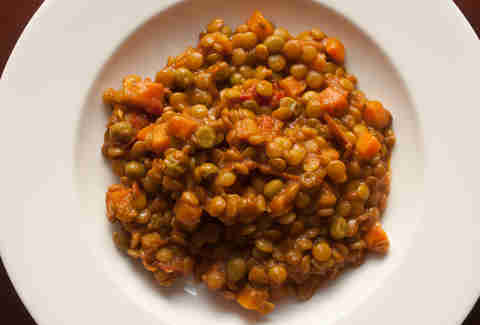 Lentils are eaten across the world for the new year because the tiny legumes are said to look like little coins, which will bring prosperity in the coming year. From Italy, to the Czech Republic, to Brazil -- whether prepared in stew, served with pork, or eaten over rice -- lentils might help you pad out your bank account in the progressing months. Kat Thompson is a staff food writer at Thrillist and considers all foods lucky (except for mushrooms, they can excuse themselves). Follow her on twitter @katthompsonn.